Introducing our new B46/B48 Engine Charge Pipe Kit for your 2016+ BMW 120i / 125i / 220i / 230i / 320i / 330i / 420i / 430i / 520i / 530i / 630i / 730i / 740e / X3 20i / X3 30i / X4 20i / X4 30i! Type III Hard Anodize Black Finish installed on vehicle. Polish Finish installed on vehicle. Brush Finish installed on vechicle. Turn up the boost with a tune and find your factory charge pipe break apart? You are not alone as this is a common situation with many enthusiast in this situation. The factory charge pipe is made out of plastic and was not designed to handle the higher boost levels. Well, fear not! The solution is here! Replace it with a higher flowing, stronger aluminum charge pipe! Made 100% of 6061 high grade aluminum, this will never happen again (backed by our Limited Lifetime Warranty)! Often ignored, charged intake airflow characteristics greatly affect throttle response, turbo lag and ultimately maximum power potential. Smooth bends and minimal obstructions are ideal. We used 6061 aluminum (lightweight) mandrel bent piping to ensure smooth transitions. The upper pipe features a long smooth transition from 2.5" from the turbocharger outlet to 3" to match the factory throttle body, ensuring a smooth transition much like the factory unit. Our competitor's on the other hand run a 2.5" to the throttle body which causes a "step" right at the throttle plate which is not ideal for flow. All flanges on our charge pipe kit are CNC Computer Machined for precision fitment and quality. The entire charge pipe is TIG welded for strength and beauty. 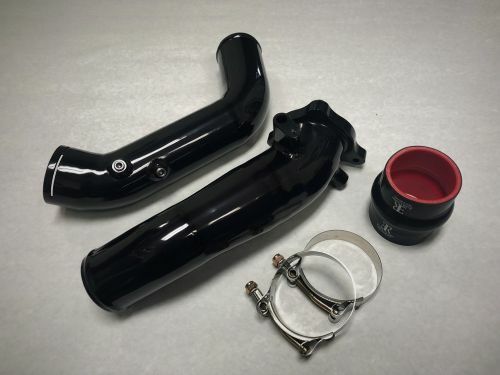 The B46/B48 Charge Pipe Kit features two charge pipes, the upper and lower charge pipes. Both charge pipes are included in the kit and are required for installation. Also, the 1/8" NPT bung can be used as a boost source. Perfect place to connect your boost gauge or other devices to. The N55 engine does not have a pressurize hose or fitting from the factory that you can easily tap into. Now you do! Requires the optional vacuum fitting. 1/8" NPT Bungs (for methanol or nitrious injectors). Each bung comes with a plug (shown). Optional Vacuum Fitting Shown.